Virgin Mobile is the first digital telecommunications service in the United Arab Emirates. Since our launch in 2017 we exist to innovate and redefine the mobile game in the region. 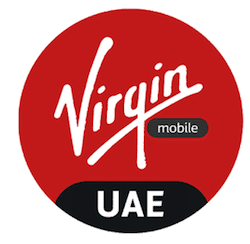 Virgin Mobile UAE is proud to be the second brand under Emirates Integrated Telecommunications Company (EITC), which means that we get to leverage great economies of scale in order to bring customers more unique and innovative products and value. Users can use the award-winning app to choose the number they want, customize a plan according to their needs, and get their SIM card delivered to their location in under an hour. And, of course, they can also manage anything related to their plan (buy roaming plans, boosters, change their plan, pause or cancel their plan, etc), without the need to phone the call center. Dubai (and the UAE) is a very unique place. People spend fortunes on special license plates for their cars and auctions for cool phone numbers go for millions of dollars. 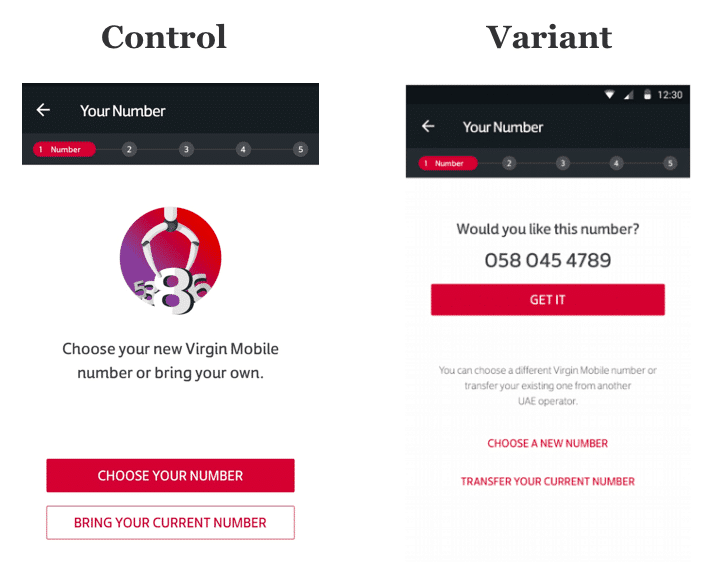 For this reason, the Virgin Mobile team assumed that allowing users to pick their own number would be very important in this country and gave it a prominent space in the sign-up flow. However, the number selection step was having the highest drop off in the flow by a large margin. The team looked to testing to better understand their users’ preferences. If we automatically assigned a random number to users (and gave them the option to change it) instead of taking them through the number selection step by default, then users who are indifferent about what number they have would not be affected by choice paralysis and would be more likely to convert. If this assumption was correct, we anticipated that at least 5% more users would continue to the next step (registration). The team used a code block test to run their experiment. The control group asked users to select between choosing a new number or transferring their existing number. The variant had both options at the bottom, but the most prominent element of the screen was showing them a random number assigned for them, with a big CTA to move them to the next screen. The variant with the random number got 9% more users to the registration step. When we later compared the week before the test to the one after, the drop off rate had gone down by almost 18%. The team learned that it’s important to test assumptions, even if the market data seems to support them. They also learned that they should minimize the number of steps where we ask users to stop and think. Instead, it’s important to offer attractive options and minimize decision anxiety.